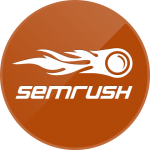 Click the link below to receive your SEMrush FREE 30-day trial worth $69.95. For ease of use the coupon will already be applied for you at the checkout. All you need to do it enter your information and the 1 month trial begins.